As we all know, germs can be spread through various means, including direct contact with surfaces, in the air, and through bodily fluids etc. Introducing an all natural essential oil spray which has been used for centuries as a protective spray. Based on an ancient recipe that has its roots in 15th century England during the time of the great plague. Grave robber thieves developed their own blend of Clove, Cinnamon Bark, Lemon, Eucalyptus and Rosemary to protect them while robbing plaque victims. We have also added Lavender and blended with Grapeseed oil, Vegetable glycerine, Witch Hazel and Distilled water. The essential oil ingredients have been used for centuries because of their anti-viral, anti-bacterial and anti-fungicidal properties, and their ability to fight and prevent airborne infections, like cold and flu, and even has been hinted at hanta virus and ebola. Use the spray to coat surfaces like phones, including mobiles, spray prior and after toilet use, use as an air freshener, spray onto palms as a hand sanitizer. It can be used in bath water for a soothing relaxing bath, and can be put in air purifiers, vaporisers and used as a room freshener. 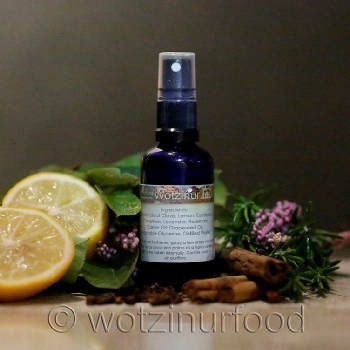 Ingredients: Essential Oils of Rosemary, Lavender, Cinnamon, Eucalyptus, Lemon, Clove and Witch Hazel. Carrier oil: Grapeseed Oil. Vegetable Glycerine and Distilled Water. Totally alcohol free. As with all essential oils, as they are very potent, use sparingly, just a few drops, and never take internally or put directly on the skin. Also, don't breathe spray directly into the lungs as this can cause irritation. There are many uses for the essential oils individually, but we recommend using only for the above uses. Please use as directed, and only if you are confident with essential oil use, should you use it for other purposes. Wotzinurfood Essential Oil sanitizer does not claim to treat or cure any disease and is solely used as a preventative measure.